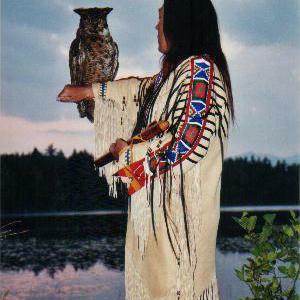 Mahaeo (Creator) knows me as Standing Owl of Northern Cheyenne descent. I began playing the Native American flute in 1998. I had never intended to play for the public. I just enjoyed the spirit of the flute. As I traveled to Pow wows selling my crafts I was asked more and more to play my flutes during the drum breaks. The response from the public was overwhelming and eventually I was asked to be part of the program at many of the pow wows in the New England area. Since that time, I have played for audiences at schools, presentations on Native culture, library systems and historical societies. I had the honor of meeting Jeff Ball at a flute class that I was gifted. It was Jeff who unleashed the gift that Mahaeo had given me at birth. Jeff was nominated for best flutest of the year in 1998. His recording Cedar Moon won in its category in 2001 at the Native American Music Awards and he was nominated in 2002 for the Native Heart award for his recording "Prairie Runner". When Jeff came to the area he asked me to open on stage for him on one occasion and play with him on another. In May of 2002 I also had the opportunity to play on stage with Bill Miller. 2003 brought many playing engagements one such was held in Laconia, NH where I was asked to participate in a week long cultural series that show cased Native Artists. Many requests for another recording brought me into 2004 with the idea on the horizon. Most of the spring and summer were spent birthing new songs. With the help of fellow musician and producer Bruce Hilton of Ghost Hawk Studios my second CD has become a reality. On August 21st 2004 Night Flight II Return of the Owl released. I hope everyone receives as much pleasure hearing it as I did recording it.